Every single person I've talked to who read this book ended up being able to quit very easily. I blasted through the first 6 chapters but then put it aside. Why? Because by the time you finish the book, you will be a non-smoker. You are supposed to smoke while you are reading the book -- that's the key. And as I was going through the chapters, every time I had a smoke I thought, "What the heck am I doing this for?" 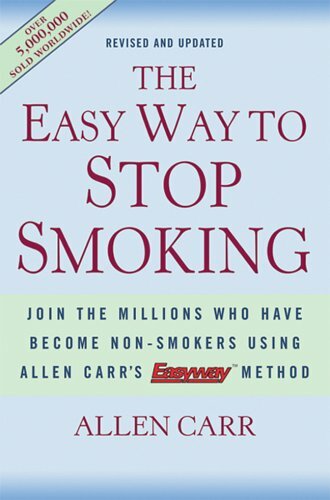 The book explains smoking in a way that makes you not want to do it. The part that really gripped me was how smoking was described as "suffocating yourself" and it really is! Every time you inhale, you aren't getting pure air and you ARE suffocating. I don't know why that simple truth never occurred to me. So back to the reason I've set the book aside: I KNOW it's going to work. So I'm foolishly doing what many others have done which is to delay finishing the book because they don't feel ready to quit! But this dilemma is covered in the upcoming chapters. I've just got to pick it back up and read it. Which I will. After one more pack. Thank-you for the book. I will suggest this book in a discreet way, saying someone told me about a book, which is true. I quit smoking a long time ago with toothpicks, it is still hard. The car windows would get brown from smoking, discussing. I wish you good luck, when you are ready to quit smoking, if I could quit smoking, anyone can. What are the short-term and long-term effects of caffeine? Caffeine takes about an hour to affect you (less on an empty stomach), and usually lasts 4-6 hours. Because caffeine is a stimulant, most people experience increased alertness, blood pressure, and breathing rate. These effects are mostly due to caffeine increasing your metabolic rate (though it has not been linked to weight loss). The drug is a diuretic, causing increased urination which can lead to dehydration. Caffeine makes many people feel jittery, “on edge,” and unable to sleep. Long-term use can lead to nervousness, insomnia, dehydration, stomach irritation, and fatigue. This is my 3rd full day without a cigarette. I am using the patch which to me is not much use. I had a scare with a spot on my lung and it scared me so bad that everytime I want one I think about what I have just gone through. The word "cancer" will absolutely stop your life in it's track. Here's hoping I can keep this up. They did a pet scan and it came back negative for any cancer anywhere. My spot will have to be checked periodically from here on out but that is a small price to pay for what I have put my lungs through all my life. Take it from me, QUIT now before it is too late! Try when you get a strong urge also chewing on maybe 1/4 piece of nicotine gum. That got me through some of the really rough spots. CONGRATULATIONS...you are past the very worst stage at 3 days. YOU CAN DO IT! I have an electronic cigarette--they are recommending that now also. Not the same as a cigarette but it helps me to "imagine" I am smoking. I am finding it a little easier with each passing day. As I said, all I have to do is remember those scan and tests that I have had the last week and 1/2 and I seem to be able to fight off the urge really good. I am cooking dinner today, son and hubby is at his sister's house, and my son told me before he left NOT to touch a cig, I told him I have gone this far so hopefully I can fight it off and keep it up. Nothing like a scare to wake you up. You know what is bad right now? Tonight for some reason all I want after eating a great meal, washing all the dishes and putting away the leftovers---I WANT A CIGARETTE SO BAD! I told my hubby I am so consumed right now thinking about it. First time in over 3 days that I have had this craving. But so far I have fought it off. Guess I will have to find something else to do right now to keep me busy. I refuse to give in. I prayed that if He would make me be o.k. that I would give cigs up and I meant it. I just didn't realize how hard that promise was going to be to keep. Thinking of you Blue Moon. I wish my Mom would have quit when the docs found her first spot. She kept smoking and died a year and a half later. Prayers for the cravings to cease. Those are the times I would add the GUM. It really does help and you never know when you are going to get those really strong urges. Just 1/4 piece of the gum will take the edge off. 10:11 AM (in 20 minutes): Your heart rate drops. drop and your lungs are working better. decrease and your lungs start to function better, lowering your risk of lung infection. Nov. 24, 2013 (in 1 year): Your risk for heart disease is half that of a smoker's. Nov. 24, 2022 (in 10 years): Your risk of dying from lung cancer is half that of a smoker's. BlueMoon - I was shocked at how quickly I stopped coughing! Keep up the good work, you can do it! Thanks Klaas for hanging with me on this. I am so determined to do this. My son has already scolded me that if he see's me with a cig in my hand he is going to throw anything and everything away that is associated with smoking. I guess I really scared him to death also. He hugged me and told me he loved me and cried when I told him the test results. I HAVE to do this not only for myself but for him also. O.K., I have been one full week without a cigarette, a miracle for me! So far I have been able to overcome my urge to smoke. I keep reminding myself about all the scarey tests and scans I just went through this past week and how overjoyed I was when they told me NO Cancer! It is amazing what you can do once you get the worst news on your health that you have ever received. A FULL WEEK!! CONGRATULATIONS!! KEEP IT UP, I KNOW YOU CAN!! I bet your family is very proud of you! It's hard, believe me I know. You're doing great! Well, I guess I am off to the store to get some gum. Klaas, today is really bad. My patch came off last night (non name-brand and doesn't stick really well) and this morning all I have wanted is a cig. I put a new patch on but that is all I can think about. I am feeling really sad and missing my cig at the moment. Guess I will run to the store and get some nicotine gum and see if that helps. It took half a day to overcome that urge for a cigarette but I did it! I guess I am going to have to invest in another name brand patch that will not come off so easily. This is not any fun. I am going to get the gum though to see if that helps. It will help, get it. Just keep it around in case. thanks a lot. I am really quite proud of myself. I just did not know I had it in me to do this. I appreciate the encouragement. I am using this spot on Scared Monkeys site to post my bad spots in the road. It helps to say it and move on. It has been two full weeks. Ya know, I might be able to survive this. So far so good. The urge to smoke is starting to diminish. I still cannot believe I haven't reached for a cigarette. I might be able to go on and throw them away now. I have yet to reach over and touched them and haven't wanted to pick one up and smoke it. My breathing is so much better and I am sleeping better at night. So far I have put on very little weight but I know it is coming so I am trying to watch what I eat. Hope I can keep this up.